Thinking of building a patio to have all your summer cookouts on? Before you get started on building your patio you will want to think about how you are going to drain the water off. If your patio isn’t properly made to drain heavy rainwater, it can hold pools of water ruining activities, damaging your home’s foundation, and getting into your basement or crawlspace. Installing a drainage system before you start building will increase the longevity of your deck or patio. What are the causes of poor drainage? If the surface of your patio or deck is flat with no slope water has nowhere to go. The result is rainwater pooling on your patio and taking longer to dry out. If you have a current drainage system and it isn’t working correctly it could be due to being clogged with debris from over the years. Is your patio close to your home? Your downspouts from your home could be causing water to pool up if they are not redirected away from your patio or deck. What to do before building a new patio or deck. Properly laying the base of your patio with gravel and sand. Make sure the base is compacted before laying anything on top. A poorly compacted sand or stone can cause a washout or water to pool under that patio. Creating a slight slope to your patio or deck will give the water a direction to move and not pool up. Installing a drainage system will help move water away from your home and your patio. If you don’t have a great way to drain the water, a drywell barrel can be installed with your drainage system to hold the excess water until the soil can soak it up naturally. What type of drainage system to use? Are long plastic or metal strips with slits in them. To install you cut the concrete to create a channel to fit the strip in. The water enters the strip and drains the water down and away from your patio. 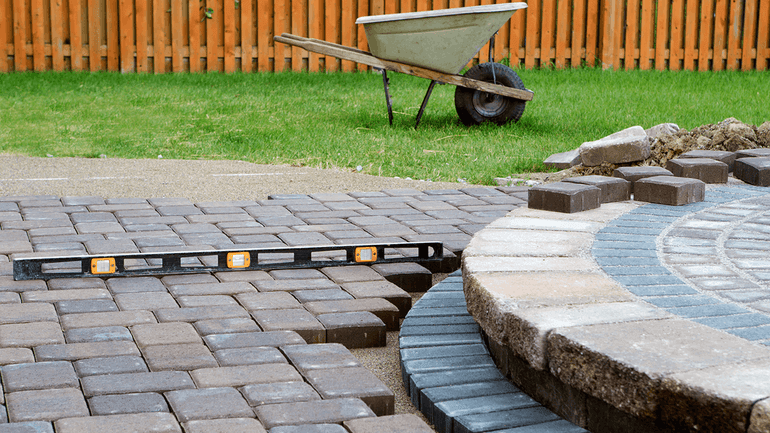 Creating a sloped surface will help to move the water to the ends of your patio or deck. The water will then flow down into the perforated pipe buried at the end of your patio. Above the pipe, you will have some sort of crushed stone or rock to help flow the water creating a french drain. Long basins are installed to divide the patio into squares. Brick or other decorative stones are set on top of the basins with small gaps between each to allow water to flow into the drainage. This drainage system should be installed when a new patio is being built. Drainage systems for your patio can help your whole home. Creating the perfect backyard space is within your reach. With the installation of a patio drainage system your cookouts and other outdoor activities will be water and worry-free.